my daughter's 15 months old now, nearly 16 months, and growing up fast and furious. of late she's been completely and totally enamored with clothes and accessories. her own, but also and especially, mine. 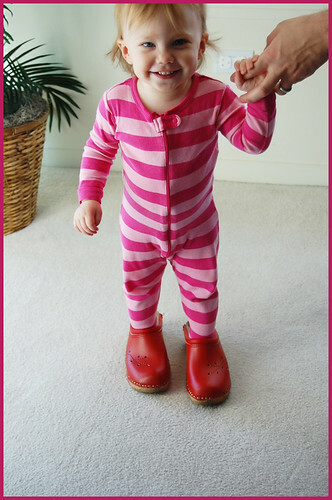 she's been wanting to wear my shoes (see her wearing my red clogs, above! ), and has even taken to grabbing my shoes (various different pairs) and carrying them around the house with her like a lovey or fetish object. she could have hours of fun just sitting in the closet amongst my pile of shoes, and she'll often grab a pair and bring them out to me, yearning to try them on. she's been repeatedly wanting to put on a gold sparkly pair of her mary janes in recent weeks, and has also been grabbing various sweaters and sweatshirts of hers and demanding that they be put on her, sometimes several different ones in rapid succession until she's satisfied. it's no surprise, to pete and i, anyway, that one of her first words was "shoe". 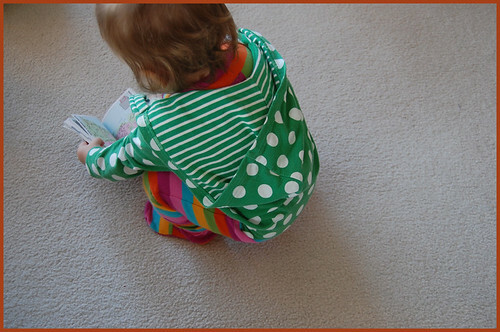 these behaviors seem adorable, if not a little precocious, no? this being my first (and probably only) child, and also, not knowing much about kids in general beyond my own...help me out, if you know: is this kind of thing normal? 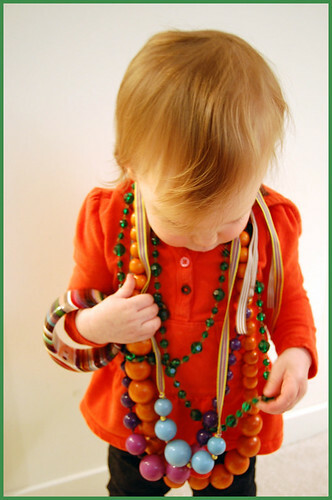 other fashionable mommas of girls out there: do your baby girls do this?? at any rate, i think it's pretty funny and very endearing. i'm wondering if she'll continue this fascination with clothes and shoes and baubles, or if it's just a passing toddler or childhood phase, wherein one's child wants to be "just like mommy" (or daddy, as the case may be)...? but, taking this further, i also wonder: how much of what we wear, what we love, what we're into, is influenced by what we see our parents/siblings/family wearing? as i see it, those around us, our families and close associates, have a big influence over us and what we wear. this can and does usually seem to go one of two ways (sometimes both, or one way or the other depending on where you are in your life or development at a given juncture): one, you can dress just like/or similar to mom and/or dad (or like the rest of your family), or you can try and do the exact opposite, as a way to exert independence and set oneself apart from whom you sprang. going with what you know, or (un)consciously going against it. i know for me, it was like this: it went both ways. i wanted, and still want to be a lot like my parents, i have some similarities in my tastes in relation to them, but have always had a stubborn streak that made me want to be my own person, stylistically, and otherwise. my dad's style is very trad, very new-england in the 1960s, very collegiate, very ivy league. and he looks amazing. i definitely see myself embracing similar tastes, a lot of times, leaning back on classics as foundation in my wardrobe, albeit usually wearing them with more than a little cheeky twist (unexpected fabrics, odd yet calculated pairings of pieces, colors, textures, etc.). dad also loves color, just like moi (boy howdy! )...we're both unafraid to wear it. as for mom, i still have a picture of her in my mind's eye that includes her sporting a chin-length blonde bob (my hair is usually some variation on the same), and if i could get my hands on some of the things she wore in the 1970s (like that long gone, camel-colored a-line wool jumper she had!) i'd be a happy, happy woman. but...there are a good many things i love and wear that i doubt my parents would ever consider in a million eons...and that's what makes me *me*, my tastes mine. and that's fine. but my parents are, in many ways, the core of me, the jumping off point from which i come, stylistically. maybe it's a little like this: you take a little from what you know, mix it with who you are inside, and volia...you have your own personal style statement. or something like that. i can't wait to see who my little poppy flower becomes. will she continue to love all the bright colors, like i do? will she still be into the shoes, the jewelry, the clothes? will she love getting dressed up as much as i do? will she clamor to wear my old things when she's older? or will she eschew it all, in favor of her own different and delightful tastes and whims? maybe she'll indulge in a little of both, remixing things her own way, playing with influences and trends and all of it. either way, it will be fascinating to watch her grow and watch her evolve, stylistically, and otherwise.